A fillable DA 3433-1 Form is a document used by the US Army. 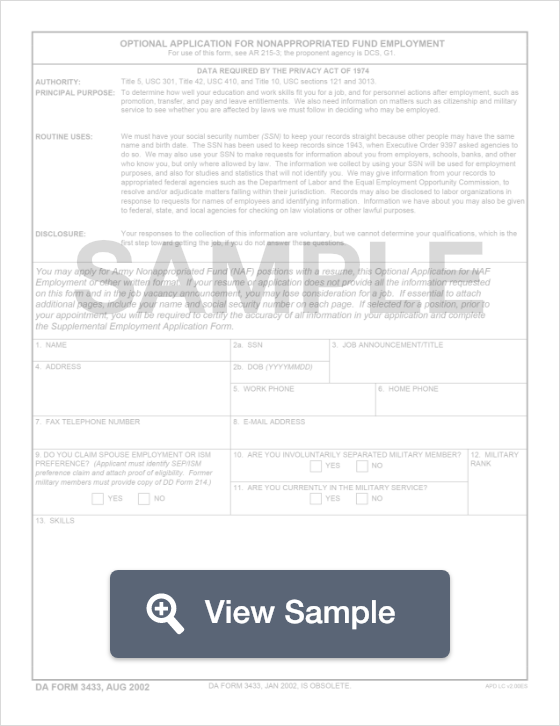 Also known as a Supplemental Employment Application Form, it is used by recruits or active soldiers to specify which job within the Army they're interested in completing. It's a bit like a job application because it requires information about the individual's work experience and education. This form will be used by the Department of the Army. It is known as a Supplemental Employment Application Form. It will be used to supplement standard paperwork for someone who wants to enlist in the Army. It could also be used by someone who is already a member of the Armed Forces, but wants to apply for a different position. The form will allow the individual to list additional information such as work experience or education. All information listed on the form will be checked by the U.S. Army through background checks and investigations. Providing accurate additional information could help someone to get a job, get a promotion, or earn a raise in their current position. Create a free DA Form 3433-1 in minutes with our professional document builder.